Came from Damascus with her family. When shelling started in the area they were living, her mother took the decision to leave, her father was not there, he had been arrested. They took few things, some toys for her smaller brother. 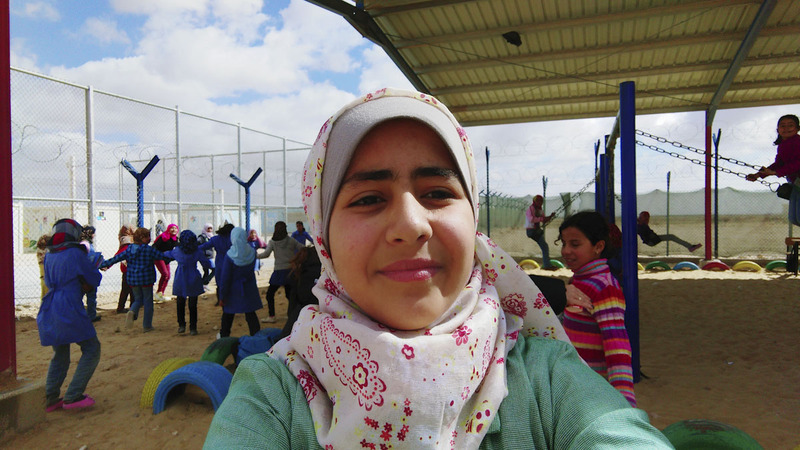 On tv Omeima had seen a refugee camp with green grass and beautiful tents, she thought she was going there, but arriving at Za’atari, she remained disappointed. She was also very sick, with hepatitis. While she was recovering, a teacher from Save the Children, Nur, came often to visit her and told her about the one minutes junior workshop. She took part making a video titled “The end of childhood”; this was her pessimistic view arriving at the camp as a refugee, the end of innocence. Now she has another idea about a video in which many girls of her age gather to project the return to Syria and its reconstruction. In her opinion, girls are more interested in education, and only education is a winning tool. She already has and idea about the title, “I am a girl and I have a dream”.